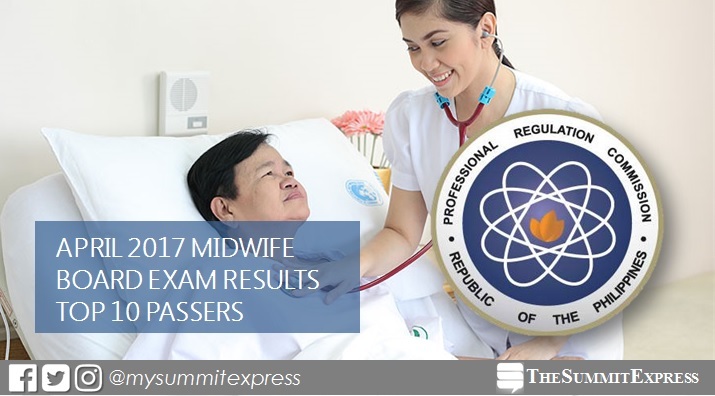 The Professional Regulation Commission (PRC) and the Board of Midwifery named the top 10 highest placers or topnotchers of April April 2017 Midwife board exam on Tuesday afternoon, April 18 or in 3 working days after the exam. Kathryn Avery Antonio Aldave of Catanduanes State University (CSU) - Virac topped the board with 91.45%. Donna Mae Bragais Imperial, graduate of Bicol University (BU) - Tabaco ranked second with 90.80%. The examination was conductedon April 10 and 11 in the cities of Manila, Baguio, Cagayan de Oro, Cebu, Davao, Iloilo, Legaspi, Pagadian, Tacloban, Tuguegarao and Zamboanga. In the April 2016 exam, Marilou Jumalon Montefalcon of Christ the King College - Gingoog City garnered the highest place with 90.50% grade. It was followed by Mary Reciel Danice Sinforoso Bernarte of Bicol University - Tabaco, 90.00%. In April 2015, Catanduanes State University-Virac graduate April Kay Vargas Calderon topped the board with 89.75%. Bicol University - Legazpi alum Carlo Cervantes Vibar came in second with 88.95%.